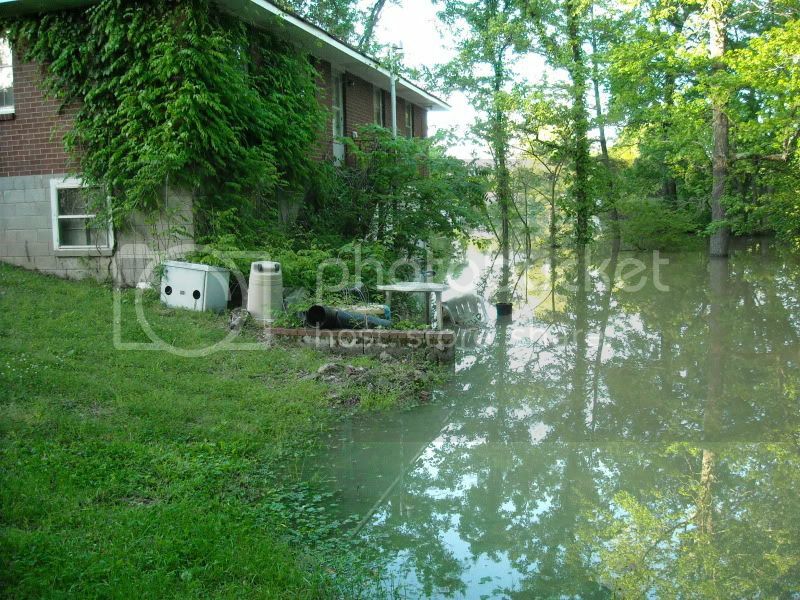 YEStalk Discussion Forums • View topic - Flood in Nashville, Tennessee! 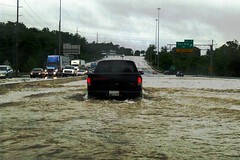 Re: Flood in Nashville, Tennessee! The real problems occurred on Sunday, after rain all day and night on Saturday. My son called from the Music City Sheraton out by the airport. He had been there since Friday night for an anime convention. They were having to check out of the room, and could I come out and pick up his stuff, since he wanted to stay for the afternoon convention sessions? So, we went out in the torrential rain, and headed for the Sheraton. The first indication that things were amiss was when we tried to get on Ellington Parkway . . . the road leading to it had a BIG puddle of water all the way across. Decided NOT to go that way - headed back down Main Street to get on the interstate there, and the entrance was blocked. So, we drove across the Main Street bridge, through downtown, and picked up the interstate on the other side of town. No problem. Got off on Briley Parkway and was taking a back road to the Sheraton that I knew to be on high ground. Right before we get to the Sheraton, there's runoff from the hill blocking the road on one side. So, we go down the wrong side of the road, turn into the Sheraton, pick up J.J.'s stuff, and head back down the back road to a gas station on Briley Parkway - I was about out of gas. Pulled into the gas station, only to find that it was raining SO hard the rain was going through the awning above the pumps! So, I stood with an umbrella under covered pumps pumping gas! Hysterical! We had about 5-6 hours to kill before we had to pick up J.J. back at the Sheraton, and were trying to think of things to do that were dry. So, we decided to go to the Great Escape - Charlotte location (they have 3 locations in town). The Great Escape is a wonderful used CD/album/book/collectibles store. We headed down Briley towards West Nashville, making a small detour to see the famed Nashville polar bears . . . . . . and also Vanderbilt University/Peabody campus (where I went to college before it was absorbed by Vanderbilt). Then we made our way over to Charlotte Pike to go to the Great Escape. Here's a couple of Arlene's pics of the site . . . This one shows Charlotte Pike blocked just before the Great Escape. 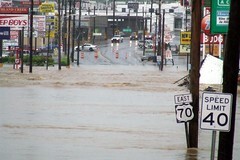 The flooding was due to nearby Richland Creek, which meanders through the area. This one is on the other side - we had cut back over to West End Avenue, and down White Bridge Road back to Charlotte Pike. The Great Escape is in the shopping center by the Pep Boys sign. Failing to go to the Great Escape, we drove on out Charlotte Pike to Davidson Rd, and turned left back to Harding Rd. I decided I could show Arlene the "ritzy" part of town - Belle Meade where all the "old money" millionaires live. We encountered a "puddle" at Davidson and Harding, which worked out OK, turned left on Harding Rd., and when we got to Belle Meade Blvd, Harding Rd. was completely blocked by water - Richland Creek again . . .
We turned on Belle Meade Blvd, drove by all the mansions, etc., and passed Belle Meade Country Club, whose golf course was a lake dotted with little islands. At the end of Belle Meade Blvd. is Percy Warner Park. It's a cool place, and it's UPHILL, so I figure no flooding THERE! I decided to drive through, and took the Overlook loop that would bring us back to Belle Meade Blvd. So, we're driving along, when I hear a noise, look in my rearview mirror, and see a TREE come crashing down right behind us, close enough for the branches to hit the trunk of my CAR!!!!! If we had come through there a second earlier, it would have smashed my CAR . . . a few seconds later, and we would have been blocked in, and had to figure out how to turn around on a very narrow road. Karma was with us . . .
By this time, we're just laughing hysterically at everything - the flood, the freaking TREE - good God, what next??? We made it out of the park, and continued on, this time trying to find somewhere to stop, eat, etc. 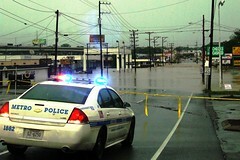 Harding Place and Nolensville Rd was flooded out. No power along Franklin Rd. so the restaurants were closed. We headed back to East Nashville and pulled into Sonic for a quick snack, and then decided to check out the Great Escape's Madison location, which was open and dry, fortunately. A few purchases later - I found a cool Allman Brothers set for 18 bucks - we set back out. By this time it was around 3:30, so we figured we'd head back across the river in the general direction of the Sheraton. Still trying to show Arlene pieces of our town, I went across the bridge in Madison to the Old Hickory area, home to the dam on the Cumberland, and the DuPont plant. Access to the dam was flooded out. Going on down Old Hickory Blvd towards the Hermitage area, thinking to show Arlene the Hermitage (home of President Andrew Jackson), it was flooded out again. No way out except to go back to Madison. So we did, and headed back down towards town. We got to Briley Parkway, which wasn't closed, and turned to go across the river into Pennington Bend, where the Grand Ole Opry House and associated hotels/tourist things are. The road SHOULD have been closed. We made it across the river just fine, and past the Opryland Hotel. Then we saw the water across the road, and folks were slowing down. By this time we were next to the Opry Mills Mall. Arlene started taking pics . . . here's the mall parking lot. And here's the water we plowed through . . . Breathing a sigh of relief, we reached the other side unscathed. Then we saw the NEXT big patch of water - OMG, this one looked even deeper and worse. There was a policeman by this one. We were trying to decide what to do. I could turn around and go the wrong way back to the Opryland Hotel exit, back through that scary patch of water we had just GONE through, or go through this next patch. We watched. The policeman was letting people drive through, and people were making it out OK. I decided to go for it. Here's the pics as we went through . . . This was the car NEXT to us. You can see how deep this stuff was! And this was the view in front of us. I was shaking by the time we got through this, and we headed on to the Sheraton to pick up J.J. without mishap. I pretty much stuck to KNOWN roads after we left the Sheraton! 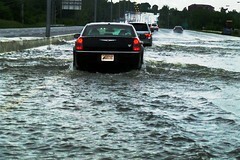 We did spin back through downtown, after my director called saying our Data Center was having some flooding problems. 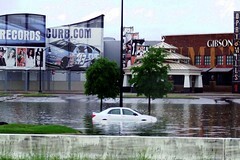 We got THIS view of Rosa Parks Blvd, which leads to the Data Center area - this pic was from the Tennessean (local newspaper) web site. Having enough of adventures, we headed for a nice dinner, and home, only to find the flood waiting for us in the backyard! The water crept up slowly throughout the night. Here's the view of my backyard the following morning . . .
You can see just how close the water was getting. Since the water had gotten in the yard twice before, and never reached the house, I had hopes . . . I went on to work that morning, after dropping off Arlene at the airport with lots of stories and pics to take home. Unfortunately, my son called around 3:30 screaming that there was TWO FEET of water in the basement! I went home not knowing WHAT to expect . . . pretty scared I would lose my A/C unit and water heater in the basement. 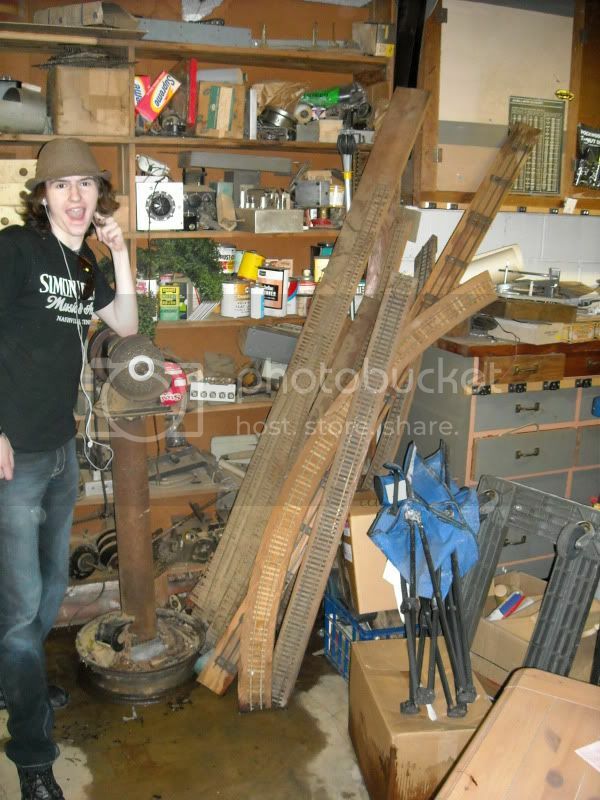 Fortunately, my son's exclamation was teenage exaggeration - there was only about 3 inches of water in the basement. Enough to make a mess, but not enough to structurally damage the house, or ruin my appliances. We sloshed through the water moving some things upstairs that I knew to be valuable, in case the water rose further. By 8 pm, the water had all but drained out. Here's the view of the back of the house, at the worst . . . Some of my neighbors didn't fare as well. 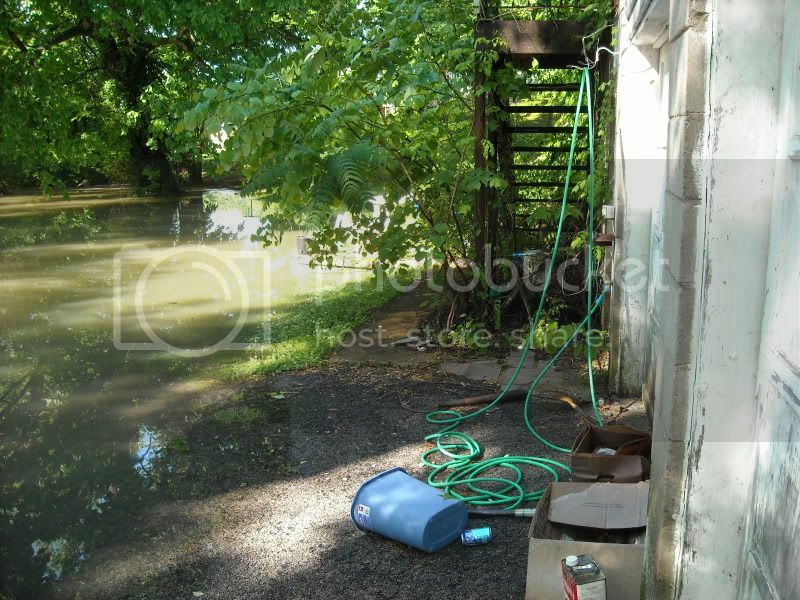 Here's the view of the house next door - they had SIX FEET of water in their basement! On up the street is a cul-de-sac that went back in the flooded area. Homes there were surrounded by the water, and their stuff was floating downstream. Much of it lodged in my backyard, stopped by trees and bushes . . .
By today, the water has finally dropped off of my driveway. And my neighborhood is just one of many that were affected. I've got two staff members who live in the Bellevue area of town - on past West Nashville where the Great Escape flooding was. One of them did OK - her house was just surrounded by water and they couldn't go anywhere, but they were dry. She reported today that the water had dropped and they could make it out to a grocery store. The other had to be rescued by boat Sunday afternoon - he lives in THIS condominium complex . . . here's another pic from the Tennessean web site. At the moment, downtown Nashville near the riverfront is still a mess. Lots of buildings have flooded basements and folks there either can't work or have to go to alternate sites. Schools have been closed all week. One of the water pumping stations is out, and they're asking folks to conserve water. All the stuff in the Opryland area is closed - the hotel won't reopen for some months, they think, and there's no word about the Opry Mills Mall. The Opry itself will be relocating for its regular weekend performances - probably to Municipal Auditorium downtown, and/or the Ryman Auditorium, which was its original home. 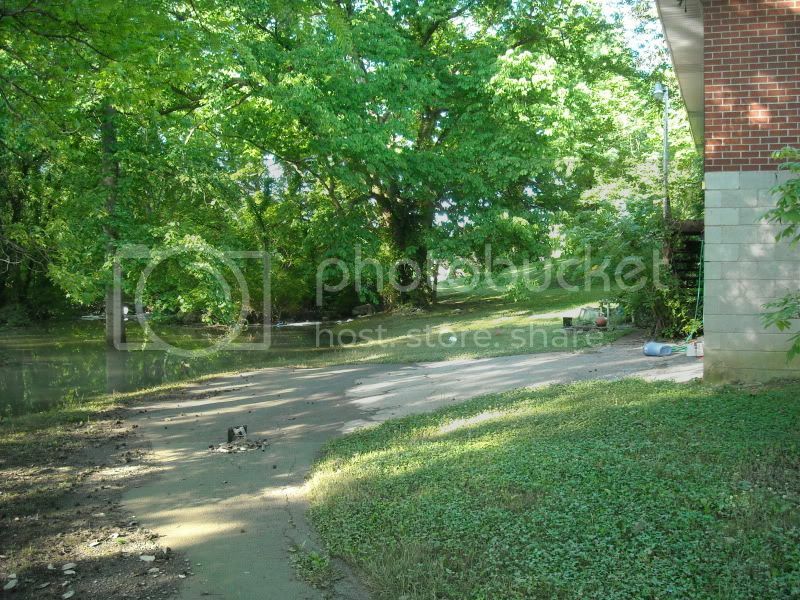 My neighborhood in East Nashville, Bellevue, Old Hickory neighborhoods still have flooding. 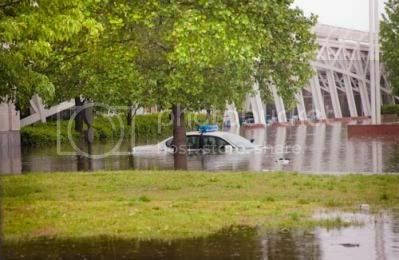 Local bus service has been suspended because their headquarters was located along the riverfront and was flooded, damaging a lot of buses. It's supposed to resume tomorrow on a limited schedule. 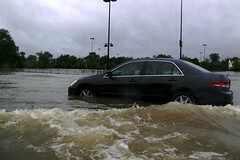 There have been 20 reported deaths in this - mostly folks swept away in their cars by rapidly rising water . . .
And that's not to mention other towns in the area. There's lots of rivers in Tennessee, and they ALL are out of their banks. We've been declared a Federal disaster area . . . I'm just very thankful that my family and friends are OK . . .
And that tree! You could have been squashed. I think I take it for granted too much that we have no form of extreme weather here. We're lucky. Yeah, the rainfall was unprecedented. It was TWICE the record rainfall here! At some point, the water just doesn't have anywhere else to go . . .
Yeah, I deliberately drove up in the park because it was on a HILL, so there wouldn't be flooding - never expected a TREE to fall on us! I'm thankful we didn't get squashed by the tree, or swept away by the water at Opry Mills . . . it's a little scary in retrospect, although it was sort of a high while we were experiencing it all . . . adrenalin rush, I suppose. The town is still pretty much in shock, I think . . . similar to after our 1998 tornado that tore through the entire town from west to east, but this has been FAR worse overall. People are telling the stories - I'm sure that's why I'm doing it out on the Yes sites - it helps to process the shock of it all. It's going to be some time before things are back to "normal" here . . . I'm told Briley Parkway reopened today over by Opryland, although it will be months before the hotels and the mall are cleaned up and back in business. Local schools are still out, and there's talk about not resuming them this close to the end of the school year, but just taking the kids grades to-date as their final grades for the year. The river is almost back down below flood stage, but not quite. 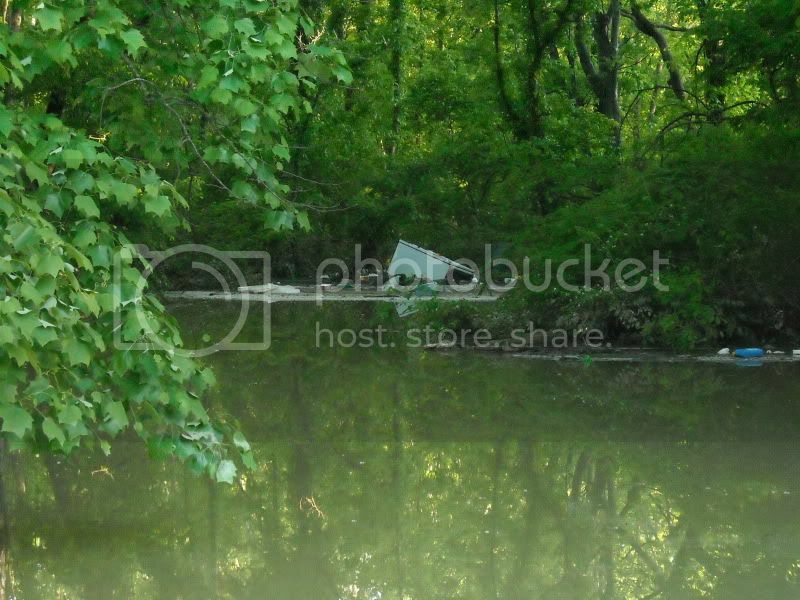 The water had left my backyard as of this morning, but the debris remains. Next step is to clean out the basement and figure out how much damage there is - probably not to the structure itself, but the belongings that got wet. And also I'll have to clean out my yard. Cleanup began this weekend . . . here's a few pics . 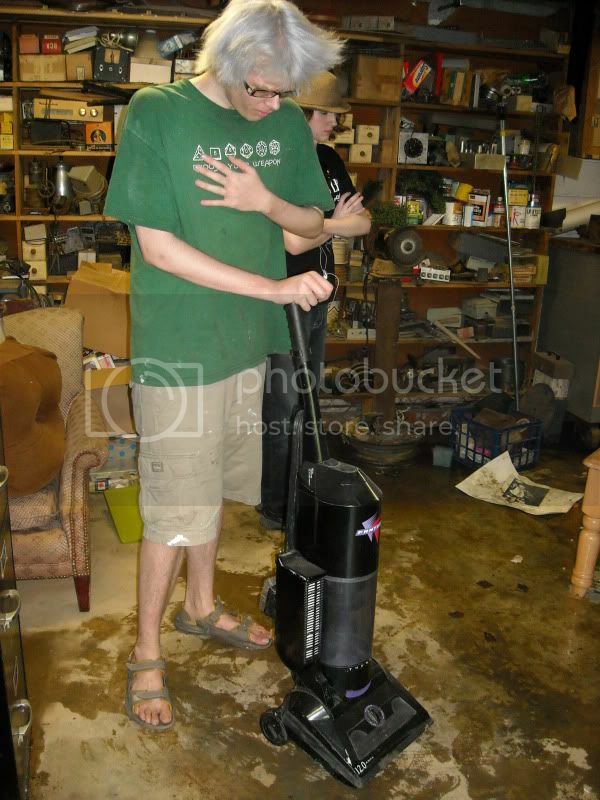 . .
My son J.J. with the carcass of my old vacuum cleaner . . .
And his friend Marshall surveying the general debris. You can see the still wet floor. I LOVE this pic - my mom used to have a lot of these jars with random sayings on them - this one swept out from under a shelf, and was so appropriate! 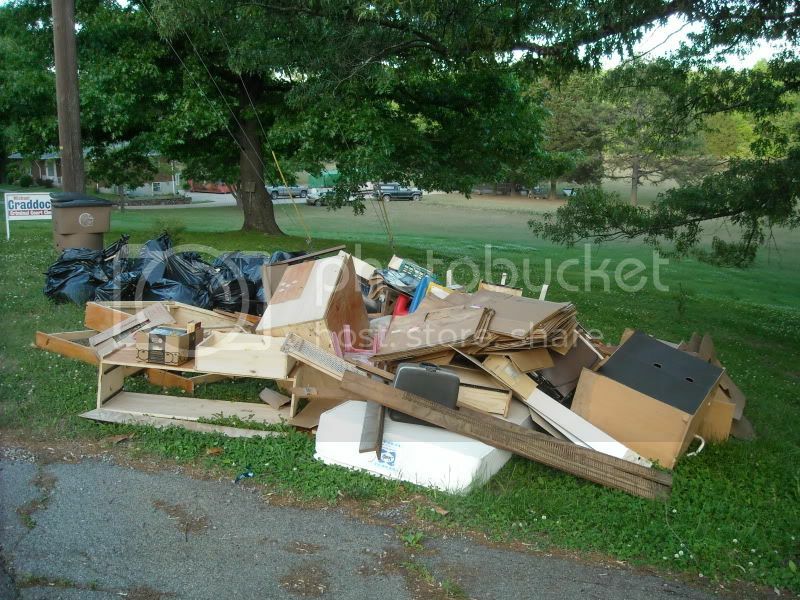 And here's the aftermath - about 30 garbage bags, 4 trash bins, and assorted boxes/furniture/etc. all hauled up to the street awaiting pickup (hopefully)! 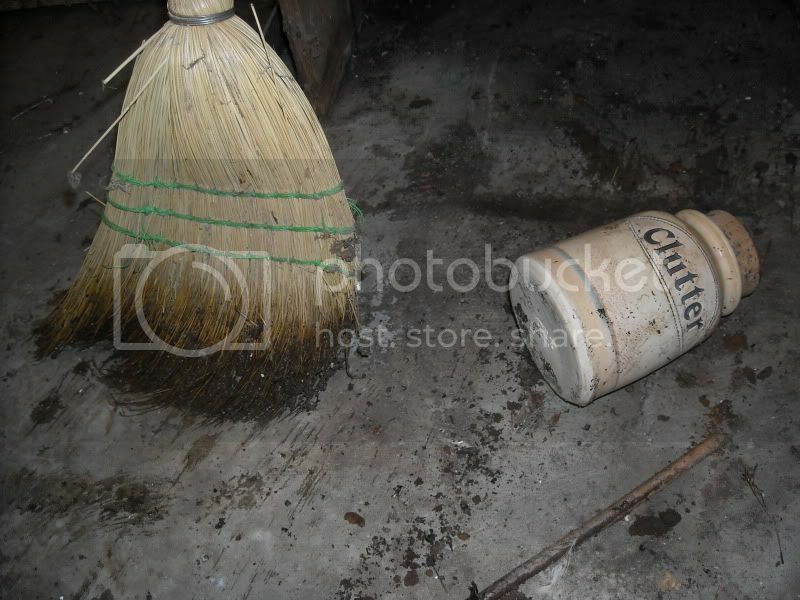 That took care of the WET stuff in the basement - I've still got a lot of DRY stuff to deal with before I can properly clean the floors . . . they're covered with a film of mud . . .
Jeez, what a lot of work. Talked this morning with one of our managers who's back at work now after dealing with HER house that got totally flooded out. She said they've got so much in their yard that it's full! Of course, most everything got wet - furniture, carpets - and they had to pull out all the dry wall (wet wall, now?). They've rented an apartment for the short term. 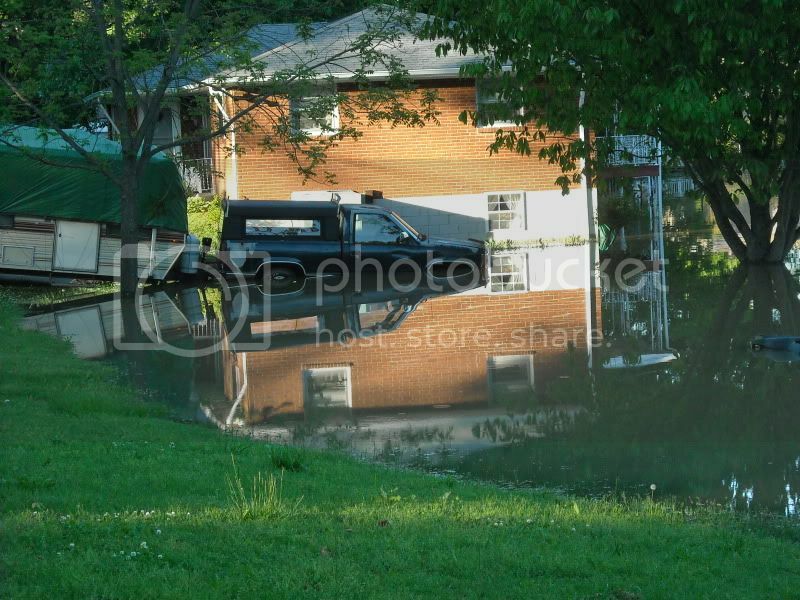 Fortunately they did have flood insurance - they lived right next to a lake - so I hope their expenses get recovered.